(click image to enlarge) Get the Home Use DVD and the Tshirt and save $5! (click image to enlarge) This 100%-cotton tee shirt — as worn by host Mo Rocca in Electoral Dysfunction — features an Electoral College logo with the slogan 'Suffragium ad Absurdum.' 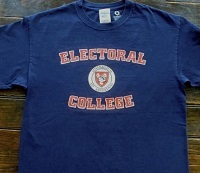 Available in navy blue in small, medium and large sizes. 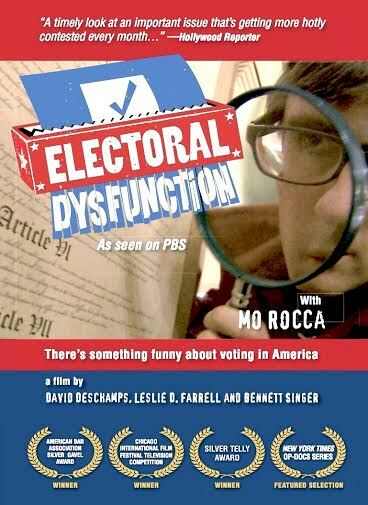 (click image to enlarge) After discovering that the right to vote is missing from the U.S. Constitution, political humorist Mo Rocca sets out on a road trip to see how voting works -- and doesn't work -- in America. He heads to Indiana, home to some of the nation's strictest election laws, and meets one Republican and one Democrat who take him inside their efforts to get out every vote. As he progresses on his journey, Mo searches for the Electoral College; investigates the heated debate over Voter ID and voter fraud; critiques ballots with renowned designer Todd Oldham; and explores the case of a former felon who was sentenced to ten years in prison -- for the crime of voting. 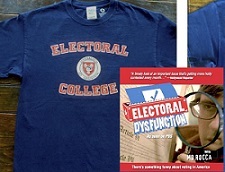 Screened at both the 2012 Republican and Democratic National Conventions, ELECTORAL DYSFUNCTION is for Americans across the political spectrum who want their votes to count. 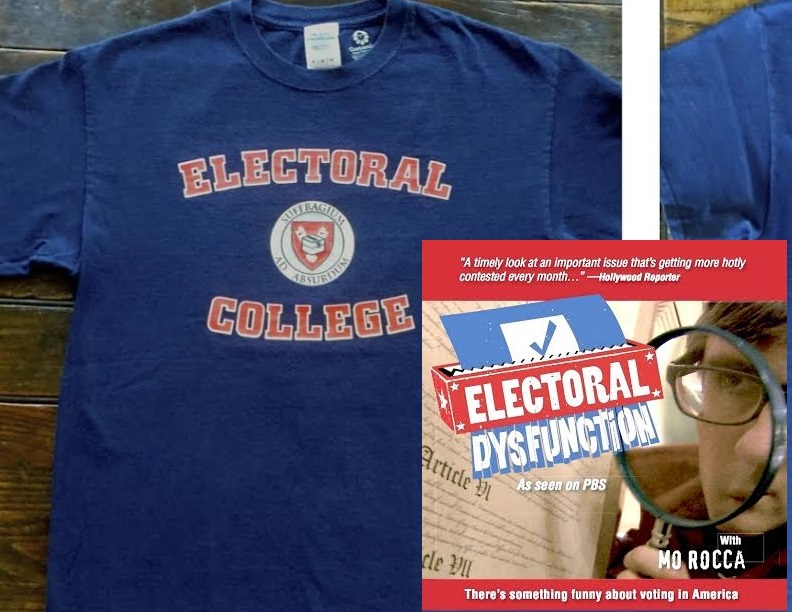 ELECTORAL DYSFUNCTION pulls off an admirable trick: It's pleasant. It treats Democrats and Republicans respectfully, and its humor, with the comic Mo Rocca as guide, is closer to Garrison Keillor than to Michael Moore. This lighthearted, colorful, nonpartisan documentary lives up to its title, exploring problems of nationwide accessibility and fairness." "A timely look at an important issue that's getting more hotly contested every month"
(click image to enlarge) For use in K-12 schools, public libraries, and non-profit organizations. Sign up to receive timely updates by email.